...... The tags also take up valuble space, increasing disk usage and download times. Exif Tag Remover allows you to easily delete all metadata tags. By doing so before publishing an image you take an active step toward protecting your privacy on the Internet! * Supports 30+ image formats. * Removes 15+ different tag formats. * Does not alter the actual image data. * Gives full control over what to remove. * Saves disk space & server bandwith. RogueRemover PRO is a utility that monitors your computer for rogue software. Qweas is providing links to Exif Tag Remover 4.1 as a courtesy, and makes no representations regarding Exif Tag Remover or any other applications or any information related thereto. 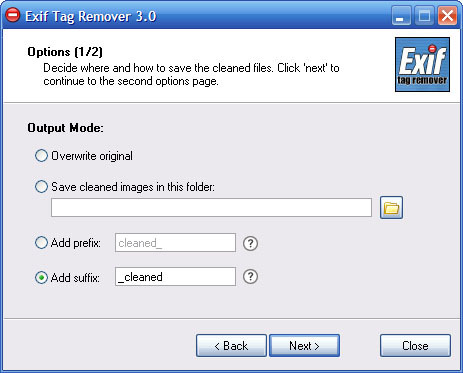 Any questions, complaints or claims regarding this application Exif Tag Remover 4.1 must be directed to the appropriate software vendor. You may click the publisher link of Exif Tag Remover on the top of this page to get more details about the vendor.